(Nanowerk News) Scientists at the Center for Functional Nanomaterials (CFN)—a U.S. Department of Energy (DOE) Office of Science User Facility at Brookhaven National Laboratory—have used an optoelectronic imaging technique to study the electronic behavior of atomically thin nanomaterials exposed to light. Combined with nanoscale optical imaging, this scanning photocurrent microscopy technique provides a powerful tool for understanding the processes affecting the generation of electrical current (photocurrent) in these materials. Such an understanding is key to improving the performance of solar cells, optical sensors, light-emitting diodes (LEDs), and other optoelectronics—electronic devices that rely on light-matter interactions to convert light into electrical signals or vice versa. 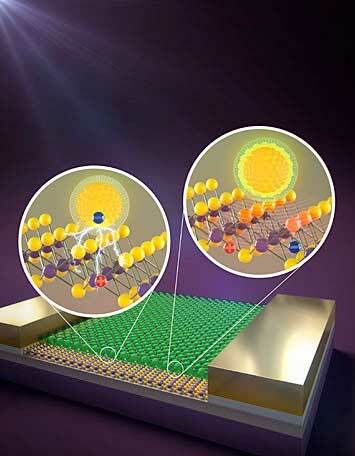 “Anyone who wants to know how light-induced electrical current is distributed across a semiconductor will benefit from this capability,” said CFN materials scientist Mircea Cotlet, co-corresponding author on the Advanced Functional Materials paper describing the work ("Distinct Optoelectronic Signatures for Charge Transfer and Energy Transfer in Quantum Dot–MoS2 Hybrid Photodetectors Revealed by Photocurrent Imaging Microscopy").